Each year as we come into the last two weeks of December, we celebrate the very best of the Solari Report. Our content builds towards our 2018 Annual Wrap Up that we publish in January 2019. We want to make sure you digest the very best of 2018 before we present our strategic thinking for the year ahead. Next week we publish links to all three Quarterly Wrap Ups and the 2017 Annual Wrap Up published in January 2018. The following week, we will publish four favorites from our weekly Solari Report interviews and Special Solari Reports. The themes for our Wrap Ups this year covered four powerful primary trends impacting our lives daily. They are constructed like intelligence briefings – designed to provide critical insight you need to make intelligent decisions. Whether in your home, for your family, at work or contributing in your community, the Solari team wants you to have reliable maps to anticipate your long-term opportunities and navigate risk. In January 2018, our 2017 Annual Wrap Up asked the question Does Your Pension Fund Have a Deep State Problem? We confronted the powerful lies being told about our pension funds and the dangerous intersection between our retirement savings and a deep state operating outside the law. In April 2018, in our 1st Quarter 2018 Wrap Up we asked Who’s Who and What’s Up in the Space-Based Economy? Our goal was to ensure you have a powerful overview as the role of space emerges as driving geopolitical force, one that increasingly involves global stock and bond markets. Given the significant growth of investment in this area, equity investors should pay attention. To help you do so our web presentation included tables of publicly traded companies active in space. In July, in our 2nd Quarter 2018 Wrap Up, we looked at The Rise of the Asian Consumer. We discovered that many of our subscribers in North America and Europe had not yet integrated the impact of the rebalancing of the US-China relationship into their strategic thinking. What a rich discussion this inspired! In October 2018, in our 3rd Quarter 2018 Wrap Up, we addressed Megacities and the Growth of Global Real estate Companies. Rapid urbanization is an integral part of the rise of the Asian consumer. As urbanization grows, global real estate and the securities markets converge. We recommend that equity investors pay attention. To help you do that we published tables of publicly traded real estate companies and REITS in the web presentation to help you get started. Each Solari Report Wrap Up includes a dedicated web presentation converted into a PDF and flip book when the publication process is complete. The material is introduced over a four-week period – each with an individual commentary and audio in addition to the web presentation. 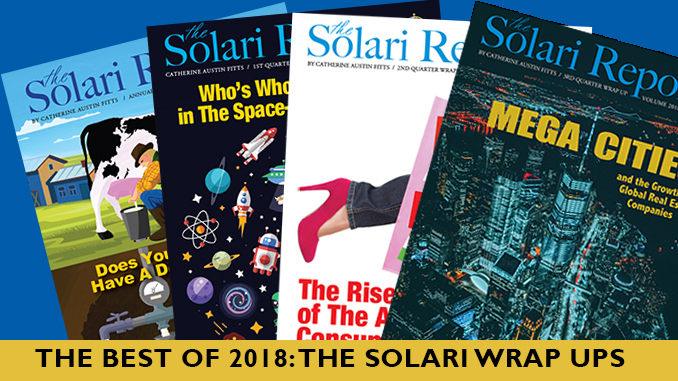 The Solari Report 2018 Wrap Ups are an excellent tool to help you understand the primary trends in your life – a fun way to build your immunity to fake news and growing disinformation. The Wrap Ups are also printed in hard copy. Digital Plus Print subscribers receive hard copies automatically. Digital Only subscribers can purchase the hard copies at our online store. For subscribers who would like to give hard copies as a Christmas present, check out our holiday special Wrap Up Gift Package. My next Money and Markets commentary will publish on January 3, 2019. Post your questions for me at the commentary here or send to Ask Catherine. I will be interviewing Dr. Farrell at the end of the month, so if you have questions or suggestions for our top stories of the year, do the same. On behalf of the entire Solari team, I wish you a very merry Christmas, happy holidays and a prosperous New Year!